Sockeye Salmon by Tonka Seafoods in Petersburg, Alaska. 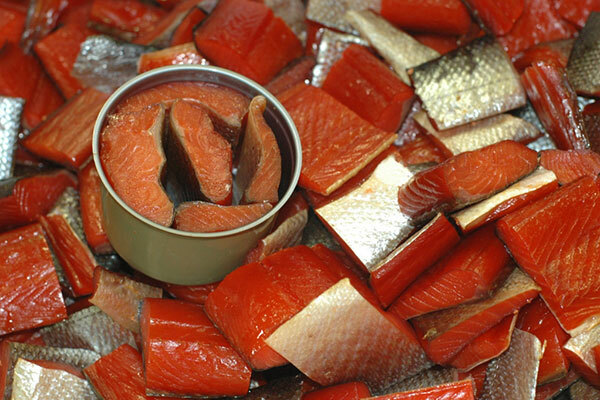 Wild Sockeye is esteemed in the fish market for its firm texture and bright, red flesh. It averages four to eight pounds dressed. Fat content is generally higher than the Silver Salmon. Smoked Wild Alaska Sockeye Salmon fillet retorted in special moisture-sealed pouches. This portion of Wild Alaska Sockeye Salmon is naturally alder smoked, and packed with no chemical preservatives or additives of any kind. Your Smoked Salmon will arrive in a clear retort pouch which needs no refrigeration until after it is opened. Great for gifts and parties these smoked fillets come in 8 and 16 ounce packages. This gourmet product uses only Wild Alaska Sockeye Salmon from the Pacific Ocean. No liquids or chemical preservatives are added. These cans don't contain "a lump" of salmon they have sticks of firm alder smoked salmon with even flavor throughout. Each can is hand packed at 6.5 oz. fish per can. A delicious treat ready to eat right from the can. These 6.5 oz. cans contain only pure Alaskan Sockeye Salmon and a little salt. No smoke, no skin, no bones, and no chemical or liquid additives - as organic as you can get. If you want the true flavor of Sockeye Salmon, this is the product for you! All of our cans are hand packed and hand inspected for quality and freshness! Other products are just a phone call away! We also produces a variety of fresh products that are vacuum sealed and frozen within hours after being caught by local fishermen. Please call us at 888-560-3662 to find out what we currently have available. See our Fresh & Frozen page for more info.